Today, U.S. corporations spend over $60 billion every year on corporate gifts but donate less than a third of that to charitable causes. For Jerry Eisenberg and Laura Hertz, this offered an amazing opportunity to tap into this market with the launch of their unique business, Gifts for Good. Gifts for Good curates premium corporate gifts that give back. Each product supports one of 40 non-profit and social enterprise partners tackling the world’s most pressing social, economic, and environmental challenges. Since their launch last fall, Gifts for Good has generated impact in over 19 states and 65 countries around the globe supporting such causes as children in need, women at risk, environment, economic development, homelessness, health and wildlife conservation. Gifts for Good believes that if every corporation purchased gifts that gave back―without spending any more money―they could redirect billions of dollars every year a year to create sustainable change. I had the opportunity to chat with Gifts for Good’s Chief Impact Officer Jenise Sterverding to learn more about this exciting new organization. Here is what she had to say. You have an interesting educational and business background mixing sociology, business, and philanthropy and went back to school in 2005 to receive a Masters in Public Management. Why did you want to combine all of these disciplines and what benefit has it been for your career? It’s funny, I never really felt like I fit in when I graduated college because it seemed that if I cared about making the world better I had to go into non-profit and if I wanted to go the business route, it was mostly about creating high profits for the business owner. At the time there was nothing in-between and not a lot of people using business for good. As someone whose personality is more of a hybrid, when I looked at roles in non-profit, they were mostly about running programs and doing service delivery and that didn’t feel like the right fit. I started my career in small businesses, but was not fulfilled because the sole focus was on profit. After about 5 years, I quit and moved to San Francisco and ended up going to work in higher education at Stanford University School of Medicine. Again, after a few years, I was frustrated by the bureaucracy of higher education as I have an entrepreneurial mind. I decided to go back to school but didn’t want to be pigeon-holed into one field. At the time, in the United States, my choices were a Master’s in Business Administration, Master’s in Nonprofit Management, or a Master’s in Public Administration. Each one of those felt too specific for me. I did some research and found SDA Bocconi University in Milan, Italy that had a Master’s in Public Management which was combining business, government, and nonprofit. So I quit my job and moved again, this time out of the country. After you received your Master’s degree, you worked for a non-profit organization called Giving Children Hope and then at TOMS in the giving department. Tell me a little bit about your role and what you learned. How has that experience helped you in your job today? I first went to work for a non-profit called Giving Children Hope, a faith-based non-profit organization that works to alleviate poverty, both domestically and internationally, through disaster relief, health and community development, vocational training and advocacy. Shortly after being deployed to Haiti after the 2010 earthquake, I was put in touch with TOMS’ newly hired Director of Giving. I had been watching TOMS grow and was interested in their model but I wasn’t certain they were really interested in making an impact. At first I declined talking to them, but later changed my mind. What I discovered is that TOMS wasn’t a marketing ploy but was truly working to drive impact. Additionally, my background in gifts-in-kind from Giving Children Hope uniquely positioned me to help them grow since that was such a specific niche; I had been moving product around the world for 4 years into impoverished communities. By the Spring of 2010 I jumped in as the second hire in the new Giving department. Like any fast-growing company, you learn a lot. I was hired to manage the relationships between TOMS and it’s non-profit Giving Partners, but we were growing so quickly that I could not do it alone. By the end of the year I had hired someone in Ethiopia (where TOMS was doing quite a bit of work), inherited a team member in Argentina, and hired two direct reports in the office. Within 6 months I had a few more direct reports in HQ. I remained solely focused on building and scaling shoe-giving as the Director was building out new programs like TOMS sight-giving. On the shoe-giving side, we had numerous challenges we had to decide how to handle: at what point would we put a cap on giving in any particular country; how did we ensure kids weren’t being given shoes by more than one organization; how did we ensure we weren’t hurting local economies; how did we know what sizes to send since we were doing custom orders; could we give additional funds to cover the expenses of shoe-distribution; and so many more lessons and challenges. It was like getting a second MBA only you weren’t reading a case study and when you are living it out, emotions and people are involved. I love giving gifts and even better, giving gifts that also give back to someone in need. I have curated an ever-growing list of Gifts that Give Back over the years and am excited to share some of the latest gifts that give back for this Mother’s Day. Each organization below works to create a beautiful, meaningful gift that also gives back to the women who make the products or helps to support a cause. Here are some of my favorite picks for the mom in your life. I hope you enjoy the list, and please share this giving guide with friends and family. (Note: To read product description, however over the image or else click on the image to enlarge to full size). All Across Africa currently works with over 3,000 artisans in Kenya, Rwanda, Uganda and Burundi, paying artisans up front for the goods at many times what they could sell them for in a local market. This sustainable income allows them to send their children to school, feed their families and even create savings accounts. In addition, money goes back into the communities in the form of education and training programs. All Across Africa believes that job creation is the solution for the rural poor in these countries. This Mother’s Day, how about giving the mom in your life a Rwandan handcrafted basket or vase. Each product tells a story of the Rwandan women who have intricately handcrafted these baskets from sweet grass and the leaves of the agave sisal plant. The intricate designs and flawless work of an experienced weaver is never the result of luck. Rather, Rwandan women owe their skills to the women before them who passed on the knowledge from generation to generation—mother to daughter, grandmother to child. Each piece is unique, culturally and traditionally inspired, and hand-woven in intimate Rwandan communities. With differing patterns and colors, one or more of these baskets will make a globally conscious and stylistic addition to your home. They can be hung from the wall or used as decor or to hold fresh fruit or a bottle of wine or even flowers. A few years ago, I began highlighting different organizations that offer wonderful gifts that also give back to a cause. Given how popular the posts have been, I created a permanent Gifts that Give Back page on my blog and last holiday season that page alone received 40,000 views in the months of November and December! I am thrilled to know that these amazing organizations and causes are getting more customers from my blog. Here are some of my favorite Gifts that Give Back for the holiday season. I hope you enjoy the list, and please share this holiday guide with friends and family. Make your gift giving season count this year by making a difference in someone else’s life and also giving an incredible gift that will make them smile. Author’s Note: The products below are just a few of the many these amazing organizations have to offer. Please visit each website to get a full view of all the gifts that give back each organization has to offer. Enjoy! As the heart and soul of ALEX AND ANI, CEO, Founder and Creative Director, Carolyn Rafaelian, created Charity by Design, which serves as a unique division focused solely on giving and making the dreams of charitable organizations come true. Charity by Design empowers non-profit organizations both on a national and local scale to reach their goals by sharing their mission through the power of positive energy and creative design. Here are three featured Charity by Design bangles below: The Pinecone benefiting Plan International’s Because I Am a Girl initiative, True Wish benefiting the Make A Wish Foundation, and Heart of Strength benefiting the Global Fund to help them fight AIDS with PRODUCT(RED). ALEX AND ANI will donate 20% of the purchase price* from each bangle sold, with a minimum donation of $25,000 between October 2017 and December 2018 to the charities. www.alexandani.com/charity-by-design/. Organic Cotton Grid Stitch Poncho – Handmade from layers of lightweight organic cotton, this soft and cozy shawl is perfect for cold weather. Designed to be reversible, featuring camel on one side and charcoal black on the other. Organic Cotton Grid Throw in Scarlet -Add a sophisticated statement to your home with the grid stitch quilt. This soft cotton throw is lightweight and breathable with a buttery soft hand feel. Use the scarlet red side for a pop of color, or reverse to bone white and easily change to a more subtle look. Bloom & Give sells beautifully handcrafted scarves and bags made in India using techniques passed on from generation to generation. Each product is designed in the US by one of Bloom & Give’s designers, and made in India with love. Bloom & Give donates 50% of their profits to support girls education programs in India through their partner Educate Girls to improve the lives of girls in Rajasthan. www.bloomandgive.com. A Special Discount of 20% has been offered to my readers. Please use the code: THIRDEYEMOM at checkout. Cloud Woolen Throw – Wine: Made of super light felted merino wool with a vibrant ombre dip. It can be used as a bed blanket, a throw, or a picnic blanket. Indigo Pillows – Made with “Khadi” – a form of heirloom cotton that is hand-spun on a traditional spinning wheel, and then hand-woven in a loom, producing rich texture and a breathable fabric with a near-zero ecological footprint. Global Wonders is a part of SA Foundation (SAF) Canada, whose goal is to stop the sexual exploitation & trafficking of young women through implementing their unique recovery model. All Global Wonders Products are handmade in Nepal by women who’ve been rescued from Human Trafficking and Sexual Exploitation. Each purchase helps to support another woman’s journey to freedom from a life of slavery. Ships products worldwide. www.beaglobalwonder.com. Embroidered Nightgowns: Whether you want a Garland, Tulip, or Butterfly stitch, each beautiful nightgown is designed for comfort with ample arm opening and a generous skirt falling to the knee. It washes, wears beautifully. Humanity Unified International is a nonprofit organization that empowers communities to rise above poverty through education, economic opportunities and food security programs. They start by investing in women. National Geographic has a wonderful collection of gifts for curious kids, trips around the world for ambitious travelers, gear and inspirational gifts for budding photographers, and even personalized gifts. Each gift aligns with National Geographic’s mission to further our knowledge and understanding of our world and helps support the non-profit National Geographic Society to fund future science and exploration. 27 percent of all proceeds from our store go back to the non-profit National Geographic Society, which funds scientific grants, research and exploration. To view the entire collection of holiday gifts offered, click here. PURPOSE provides freedom from slavery for young women around the world. Each piece of jewelry is handcrafted by artisans escaping human trafficking. Every purchase changes a life! PURPOSE is the brand under International Sanctuary, which is a nonprofit whose mission is to empower people escaping trafficking to embrace their true identity and worth. SOS Children’s Villages (www.sos-usa.org) is an international organization that builds loving, stable families for orphaned, abandoned and other vulnerable children across 135 countries, including the US. Through their family support and care programs, medical centers, schools and emergency relief efforts, they impact the lives of millions of children and families worldwide making sure that every child has the support and care he or she needs to grow, thrive, and lead a fulfilling life. SOS Children’s Villages is proud to partner with ALEX AND ANI. The specially designed “Imagine” Sandcastle Charm Bangle represents the strength and love that helps us build strong families for vulnerable children. From May 2017 to December 2017, SOS Children’s Villages will receive a 20% donation of the purchase price to support its mission in building families for children in need in 134 countries, including Syria, Ethiopia and South Sudan. The bangle can be purchased at ALEX AND ANI retail locations, online, and through authorized retailers. For the holidays, Sudara is offering discounted robe and short sets and holiday pajama sets with an average of 20% savings on original pricing as well as limited edition holiday colors. Too Young to Wed, a non-profit organization, that employs visual media, photography exhibits and campaigns to educate and engage the global community to demand an end to the practice of child marriage, has launched a print sale of beautiful, hand-printed 8.5×11 archival pigment prints by Kenyan child marriage survivors and Too Young to Wed Founder, acclaimed photographer Stephanie Sinclair. Prints are $100 each – with 100% of proceeds going directly to support Too Young to Wed’s important work in communities affected by child marriage. Visit WWW.TOOYOUNGTOWED.ORG/PRINTSALE to take home a photograph and help put a stop to early, child and forced marriage around the world. Anita, 15, as photographed by Monica, 12. Both girls were rescued by the Samburu Girls Foundations, supported by Too Young to Wed.
Sisters Yagana, 21, Yakaka 19 and Falimata, 14, were all abducted and held captive by Boko Haram until they escaped. The militant Islamist group, began itís insurgency against the Nigerian government in 2009. The terrorist group drew global outrage after abducting more than 270 schoolgirls from the town of Chibok. Many of the girls were forced into marriage and motherhood. Anita, 15, enjoys the breeze at the Rift Valley viewpoint at Malasso, Kenya. Photo by Jane, 15.Named after an eight-year-old child bride in Yemen, Too Young to Wed’s Tehani Photo Workshop brought together 18 brave girls — including 6 student instructors from the previous year’s workshop — who escaped their marriages and were given the opportunity to pursue their education through the support of the Samburu Girls Foundation. Vibes Hi-Fidelity Earplugs are reusable earplugs designed for live music. Unlike traditional foam earplugs that block and muffle sounds, Vibes lower the volume of your environment to a safer and more comfortable while still allowing you to hear everything around you clearly. These two coffee table books, Chicago Unleashed and Chicago Monumental by Larry Broutman. Chicago Unleashed and Chicago Monumental not only make a unique gift for book lovers, photography lovers, and travelers, but purchasing these books supports a worthy cause as all author proceeds from both books go to the Chicago Lighthouse for the Blind and Access Living Chicago. Chicago Monumental is an elegant, full-color, hardcover book of photography with images and information on over 250 public memorials, statues, and fountains located in the Windy City’s parks, streets, storefronts, bridges, and cemeteries. Chicago Monumental has recently picked up two book awards: a Midwest Book Award for best interior design and an IPPY (Independent Publisher) Award in the Great Lakes Nonfiction category. Both can be ordered at Amazon.com. Looking for more ideas? Please feel free to check out my permanent page of Gifts that Give Back here for even more amazing products. Also, if you like this gift guide please share via social media. Think of the collective difference we can all make! Moeloco “Dream Crazy”: Buy One, Give One and Change a Life. Have you ever had a dream that seemed impossible and almost crazy? Kathy Wong, an entrepreneur from Australia did. After a career in business, Kathy came out of retirement to start a social enterprise named Moeloco which is a combination of two words, “Moe” derived from the Hawaiian word Moehani, meaning “dream” and “loco” is latin for “crazy”. “Moeloco is my dream crazy. This dream began when I realized how disconnected humanity had become” says Kathy Wong, founder of Moeloco, a social enterprise dedicated to changing the lives of children living in extreme poverty. When Kathy learned that over 300 million children lack shoes, her entrepreneurial spirit and loving heart sprung to action and she founded Moeloco. Kathy chose flip-flops as her vehicle to fuel her social enterprise. In Australia and other parts of the world, flip-flops are a fun reminder of freedom and inspiration. Kathy jumped on that theme and designed each colorful flop-flop to leave a positive message in the sand such as “Be Happy” or “Love”. Kathy’s mission is to build a heart-centered community who realize that their consumer dollar has enormous potential and power for positive social impact. Each purchase creates a ripple effect starting with the consumer and positively impacting the lives of underprivileged children and their community. For each pair of flop-flops, Moeloco will donate one pair of covered canvas shoes to a child living in poverty through their collaboration with the Hope Foundation, an Ireland-based non-profit working to help the street and slum children living primarily in Kolkata, India. Each pair of donated shoes protects a chid’s feet, and also helps change their future by ensuring they can attend school. If you have followed my blog for awhile, then you know how much I love curating my ever growing list of Gifts that Give Back on my blog. It has become my most popular page and is the most widely searched of all my content. When I saw a post on my friend’s blog Epicure & Culture on wines that give back I was elated. I love wine and I had no idea that there are wines that taste delicious and also give back to a cause to make a difference. She agreed to let me share the post here. I look forward to ordering some of these wines and knowing that I am also doing good while enjoying a delightful glass of vino! 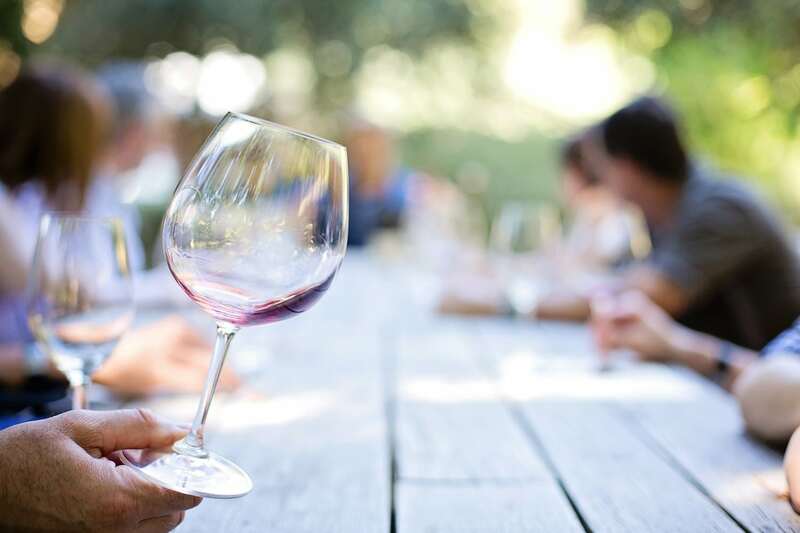 There’s nothing like a glass of wine to help you relax after a stressful day at work or to complement a meal. While the alcohol in wine helps make you feel good, you can enhance that warm fuzzy feeling by purchasing the following bottles. With these you won’t just be sipping your everyday merlot; but wine that gives back to social causes and the environment. Read on to choose which sip you want to support, from sustainable seafood to stopping animal cruelty to providing jobs for ex-inmates and beyond. Cheers to that! Berlin, creator of Proud Pour and bottles. Photo courtesy of Proud Pour. 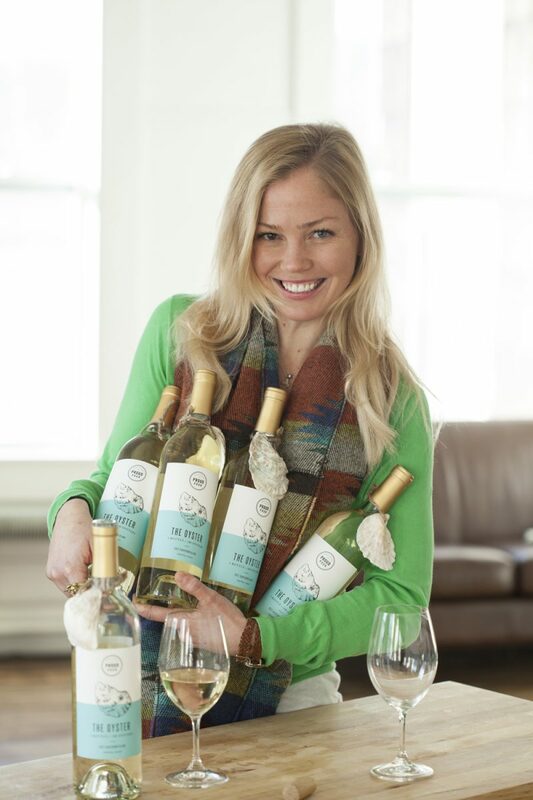 Their sauvignon blanc is sustainably grown on a family-owned vineyard in California. The wine’s floral notes are well balanced with minimal acidity and a smooth minerality to pair perfectly with farmed oysters. 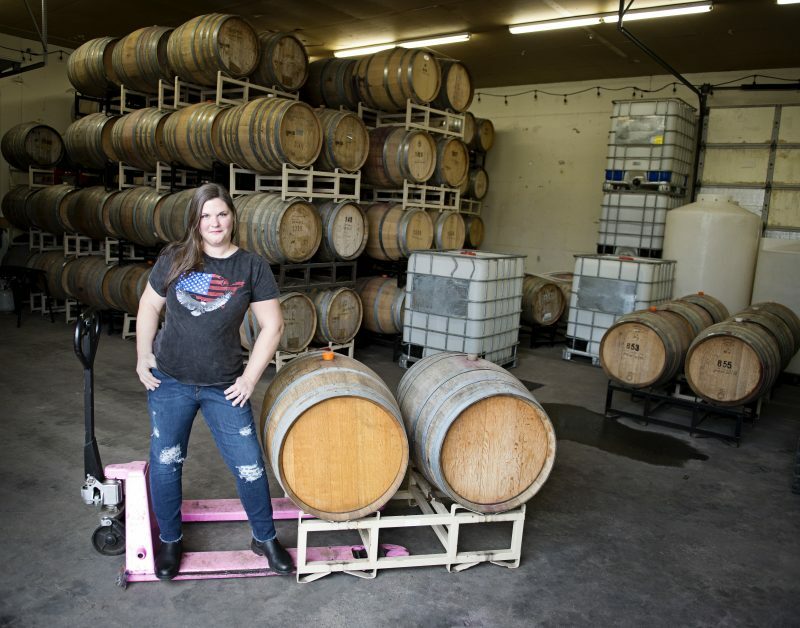 Meg Murray of Nasty Woman Wines. Photo courtesy of Nasty Woman Wines. Searching for that last minute holiday gift? Why not consider a beautiful gift that also gives back from Macy’s Heart of Haiti or Rwanda Path to Peace product line? Designed to improve and enrich lives, Macy’s extraordinary collection of handcrafted art makes change and hope possible in Haiti and Rwanda. Both programs were developed using a “trade-not-aid” model that connects Haitian and Rwandan artisans to the global marketplace, providing a sustainable income to reinvest in their families, health, education and lives. I have written extensively about both initiatives before and even had the incredible opportunity to go to Haiti in February 2015 to meet the Heart of Haiti artisans in person. Haiti was a life-changing trip where I witnessed the deep love of the arts and creativity in a nation that had been hit by so many tragedies yet remains so incredibly resilient. Some of the amazing art produced in Haiti for Artisan Business Network. Metal artisan Jacques Roodlet at Le Panier Workshop. The situation in Haiti still remains dire. The devastating earthquake of January 2010 and the most recent hurricane in 2016, have made it virtually impossible for many Haitians to make a living. Out of a population of 10 million people, an estimated 400,000 Haitians are artisans who rely solely on their handcrafted goods as a source of income. Astonishingly, the arts is the largest sector of employment in Haiti. Haitians have a deep-rooted love and culture of many different forms of art ranging from metal work to sandstone carvings to paper-mache and painting. Heart of Haiti was established after the 2010 earthquake as a way to help the Haitian artisan economy survive and access markets. The first collection of Heart of Haiti products was launched in the fall of 2010 by a partnership between the Clinton Bush Haiti Fund and humanitarian Willa Shalit, and the initiative has grown steadily ever since. Today, Heart of Haiti employs 550 artisans providing a steady income that benefits an extended 4,500 family members. This means more people are able to repair their homes, pay school fees for their children, and feed and clothe their families. Steady income means better nutrition, improved education, and access to healthcare. Now entering its seventh year, the Macy’s Heart of Haiti program continues its goal of helping Haitian artisans achieve economic empowerment through the sale of their handcrafted goods. Artisans receive 22 percent of the retail price for each item in the collection. This holiday season, why not consider purchasing a Heart of Haiti tree ornament? Capture the true spirit of the holiday season with this fir-tree shaped ornament. Crafted with recycled metal and hand-painted by artisans from Haiti, this ornament can both decorate your Christmas Tree and help sustain fair trade opportunities for the communities that need it most. With a red organza ribbon attached for hanging, you can make your own unique winter wonderland. $13.00. To purchase this ornament, click here. I also really love the incredible metal art made out of recycled metal and the paper-mache. When I was in Haiti, I got to visit both metal artisans and paper-mache artists. It was amazing to see how they create such gorgeous works of art. Here are a few of my favorites below.